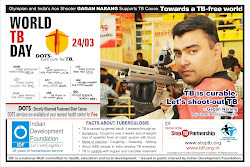 IDF social ambassadors thought it fit to take a step ahead and organise Summer Fungama Part 2 at Malad West, Mumbai on 22nd May 2011. The response was very good and students took part in Drawing, Quiz and Dance workshop. While the children were busy, the ambassadors kept the parents updated on IDF's humanitarian work. Congrats to IDF social ambassadors - Varsha, Nithya, Anupam, Kartik, Ajish, Keshav, Nisha, Simone, Athira and Sanjana for organising such a meaningful event. Beautiful minds penning down thoughts, a vista of spectacular paintings, melodious voices dazzling the audience and filling the atmosphere with cheer, quiz pros at their intellectual best and dance moves encouraging happy feet, enlivening the ambiance and captivating onlookers. 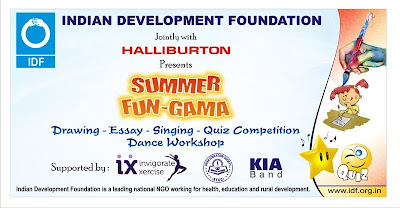 Such was the experience on Sunday, 15th May at Summer Fun-Gama 2011, an event organized by the social ambassadors and volunteers of Indian Development Foundation (IDF), an NGO that has been working for nearly three decades in the areas of health, education and rural development. This mega event co-supported by Halliburton had a good turnout of hundreds of children from the age group of 5-16 years from different parts of Mumbai. Children thronged to Vivek Vidyalaya campus at Goregaon West, Mumbai on a Sunday morning to showcase their talents. 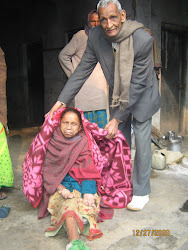 For complete news - CLICK NEWS. Indian Development Foundation (IDF) is organizing a `Summer Fun-Gama' onSunday the 15th May 2011 at Vivek Vidyalaya, Siddharth Nagar, Goregaon (West), Mumbai from 9 am to 3 pm. 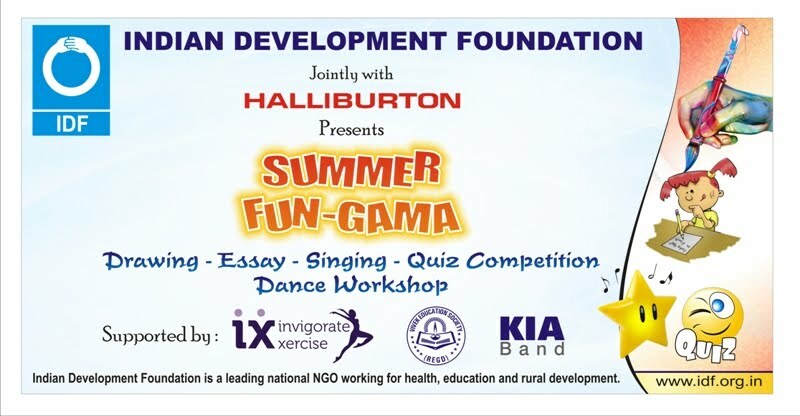 We are delighted to inform you all that this mega event is co-supported by Halliburton Volunteer Council (HVC) - India. Since World Environment Day (05th June) is getting closer, the theme for the event will be related to environment and its protection. 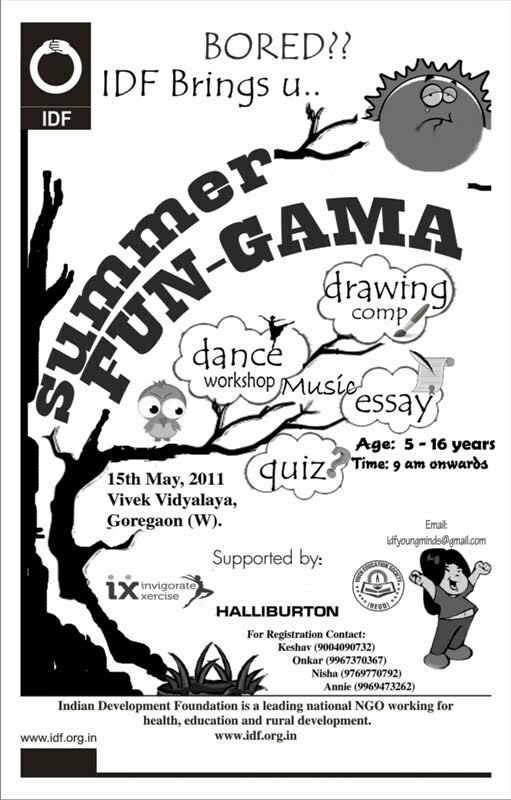 Children in the age group 5-16from different parts of Mumbai are invited to participate in `Summer Fun-Gama' and express their skills in Drawing, Singing, Quiz and Essay writing competitions. A special dance workshop is also arranged by Invigorate Xercise team for children from 10-16 years. Entry is FREE for all children. We request you to witness the event and motivate the young minds. Also you can also request students to participate in the event and express their talents. Every participant will be given a Certificate of Appreciation and special prizes for the winners. Kindly see the attached poster for registration details. Summer Fun-Gama is managed and co-ordinated by IDF Social Ambassadors and Volunteers. We truly value your time and appreciate your ongoing kind support on our various social activities. 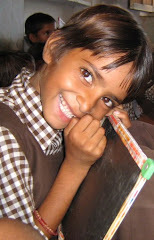 Prarambh Bal Gurukul at Batta Basti, Near Shastri Nagar, Jaipur has 70 students who get benefit of education. IDF in collaboration with Prarambh Foundation run the Bal Gurukul for those children who need the most. Dr.A.R.K.Pillai and Dr. Narayan B. Iyer from IDF visited the Bal Gurukul and felt happy to see the progress. Congrats to Mr.Sandeep Edwin who is monitoring the Gurukul. Also special kudos to the teachers - Sheeba, Sonu and Asha - for imparting excellent education. IDF announced an iDiscover programme for the students and they will be taken to Birla Planetarium during May 2011. 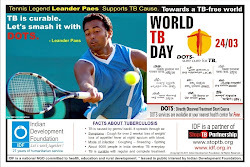 Indian Development Foundation thank the schoolteams in Shekhawati region (Sikar and Jhunjhunu districts) in Rajasthan for extending support to leprosy/ TB and education programmes. Dr. A.R.K.Pillai, founder President and Dr. Narayan B. Iyer, CEO, IDF called on the education heads during the first week of May 2011 visit. Shri Dilip Modi, Chairman and Shri Ravi Shankar Sharma, Principal of Jhunjhunu Academy, Jhunjhunu. Shri Ramakant Agarwal, Chairman Executive and Shri S. C. Karnatak, Principal of Dundlod Vidyapeeth, Dundlod, Jhunjhunu. IDF Salutes Schoolteam for their constant support to humanitarian causes.